In August 2015, I was chosen to represent the Made at Sac State campaign for California State University, Sacramento. I earned my theatre degree from Sac State in 2005; but started way before that. In fact, when I first started at Sac State, I was a business major. I learned a ton, but I knew this wasn’t my path. I took a semester off, did a lot of reading, and went back to school that next semester as a theatre major. It was like wearing a comfy pair of slippers. I finished all of my theatre classes in 2000, but I had one G.E. class to finish. Then life happened: Mackenzie was born and then Kennedy. I finished that one class in 2005. Choosing theatre at Sac State was one of the best decisions of my life. Everything I learned at Sac State I still use today. I never would have imagined that a friend’s one-off suggestion to try sketch comedy would have led to owning my own business, theatre, and school, let alone being recognized for it, somehow. So, thank you, John Catching! I wanted to be a “serious actor” when I started in the theatre program at Sac State; also wasn’t my path. I love being a comedian. But I am a better comedian because of all of my acting training at Sac State. The Made at Sac State program showcases honorees all over the city, on buses, billboards, signage, and websites. It’s a pretty surreal feeling to be driving down the highway and see a ginormous image of yourself looming over traffic like Godzilla. But it’s also a good feeling. The program has been a great way to get word out about what we do at Sacramento Comedy Spot and the Sacramento Comedy Foundation. I’m very proud of how much our community has grown and strengthened. I can’t wait to see where we go from here. 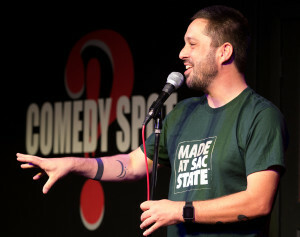 Read someone else’s words about me and the Comedy Spot’s beginnings at my Made at Sac State page.